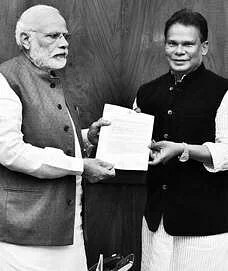 ROURKELA:Rourkela BJP legislator and former Union minister Dilip Ray on Thursday met Prime Minister Narendra Modi and apprised him about the inordinate delay gripping two mega infrastructure projects of Rourkela despite the PM’s announcement on the projects in April 2015. Modi asked Union Labour and Employment Minister Bandaru Dattatreya to expedite the upgradation of RSP-run Ispat General Hospital (IGH) of SAIL into Super Speciality Hospital and Medical College, Ray said. In a subsequent arrangement, SAIL has decided to implement the IGH project in collaboration with ESI Corporation, he added. Ray further said the PM also asked Union Minister for Road Transport and Highways Nitin Gadkari to expedite setting up of the second Brahmani bridge at Rourkela as part of NH 143 expansion project. Entry filed under: Health Care Facility, Higher Education Zone, Ispat General Hospital, Rourkela, Region watch, Sundargarh-Rourkela-Panposh-Bonai, Sundergarh, Uncategorized.